Agriculture Equipment Market size is set to exceed USD 200 billion by 2024; according to a new research report by Global Market Insights, Inc. The shipments exceeded 5 million units in 2017. Exponential increase in population levels have generated the need for increasing the crop quality & yield through advancements in the technology, livestock monitoring and the growing usage of fertilizers and pesticides, thereby driving the agriculture equipment market growth. This has also led to increasing labor costs and the adoption of automated machines in farms. Several machines are being developed depending on the tasks and activities performed in these fields. These modern technologies have revolutionized the farming techniques. Moreover, with the ongoing urbanization trend, consumers are demanding a better standard of living and diets. The rising need for these demands will spur the demand for agricultural products, thereby providing an impetus to the agriculture equipment market growth. Government administrations across the globe are offering various benefits to the farmers, such as subsidies, loans, and easy installment plans, for buying the machinery and other farm equipment. These government initiatives are encouraging the farmers to increase their productivity and cultivation to satisfy the growing demand of the consumers for food products. For instance, the Government of China has been investing heavily to support the developments in its agriculture market by granting subsidies for machines and tool procurement. From 2004 to 2014, the government offered subsidies of over USD 17 billion to the purchase 16 million units of the agricultural equipment. Such initiatives are anticipated to positively impact the agriculture equipment market. The increasing need for mechanization of seeding processes is expected to drive the agriculture equipment market growth. Manual seeding process has several disadvantages such as farmer fatigue and lack of uniformity in the spreading of seeds. These factors can be overcome by providing automated products in performing the farm activities. Moreover, these machines also help in spreading fertilizers evenly and in adequate amounts to ensure proper germination of seeds. This equipment is also integrated with remote monitoring and control sensors, which provide the farmers with updates & records of the processes and activities performed. These factors are encouraging the farmers to adopt these machines thereby driving the agriculture equipment market. Plowing and cultivation machines are experiencing a high demand in the agriculture equipment market owing to the growing need for these machines in farm fields. This equipment is used for soil preparation by stirring and pulverizing the soil and help in providing mechanization and automation of farming activities. To satisfy the growing demand for agriculture equipment market, suppliers in industrialized countries will invest in a variety of new advanced equipment. Several technological advancements in these machines are providing effective solutions to the farmers in cultivation and plowing of their fields. For instance, Kverneland is developing plowing machines, equipped with auto-reset systems that are adaptable to varying soil conditions. 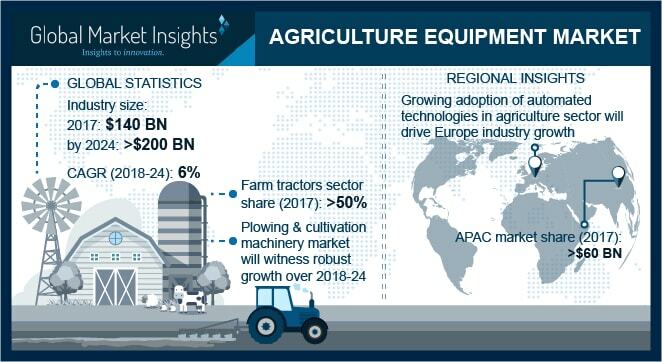 The Europe agriculture equipment market is experiencing a high demand for such machines owing to the growing adoption of automated technologies. Countries including Italy, Germany, and France are moving toward automation and adopting several smart industrial solutions for manufacturing processes. Moreover, labor shortage in the region is also a factor, which is driving the adoption of mechanized products in farms. These machines are performing several farm activities with maximum accuracy and productivity, thereby encouraging the farmers to implement the mechanized technologies in their agricultural processes. The agriculture equipment market is anticipated to witness a high rise in the production capacity with competitors embracing advanced methods of manufacturing. Major players operating in agriculture equipment market are AGCO Corporation, JCB, Kubota, Claas, Deere & Company (John Deere), Bucher Industries, Dawn Equipment, CNH Industrial, CNH Industrial, Mahindra Tractors, Same Deutz-Fahr Deutschland GmbH, Force Motors Ltd., Kverneland Group, International Tractors Ltd., Kuhn Group, Iseki & Co., Ltd., Escorts Group, and Tractors and Farm Equipment Ltd., among others. Agriculture equipment market players are engaged in providing effective solutions, which will ease the difficult tasks performed by the farmers in their fields. The growing demand for smart technologies in automated machines is providing an opportunity for players to develop innovative products in the agriculture equipment market. It includes mobile connectivity, real-time monitoring, record-keeping, and task alerts. Many players in the industry are acquiring existing players and building new production plants to increase their production capacity.